The UHURU 2.4G Compact Wireless Keyboard and Mouse Combo is the latest improved version. It adopts fashionable, elegant design and smooth figure, making you feel good. Butterfly structure keys with soft-touch enables more comfortable typing experience. Delicate appearance, comfortable hand feeling, reliable connection, give you best usage experience. ·Perfect compatible with Windows 10 / 8 / 7 / Vista / XP/ IOS/ MAC. ·Without any driver, just plug the Nano-receiver into the USB interface of computer, it works. ·Nano-receiver storage slot is on the back of the mouse for convenient travel in your laptop bag/briefcase. Keyboard come with 13 hot keys, help you save time and effort. ·You can easily realize the multimedia work through this keyboard press together FN with hot key. ·The shortcut buttons perform the following functions: volume +/-, next / previous track, next / previous page, search, home page, bookmarks, mute, play / pause, etc. The special shape will fit comfortably in your palm which will keep your hand from getting tired. You will remain comfortable even after long hours of using. Soft touch and compact keys are very comfortable and sensitive to type. It can prevent some occupational diseases like keyboard hand from happening. 3 DPI levels (800/ 1200/ 1600) to suit both ordinary and gaming needs. Optical laser allows for quick response, precise movement, and smoother tracking. RELIABLE 2.4 GHZ AUTOMATIC LINK. Advanced chip provides 33 feet wireless automatic connection for fast data transmission without any delays, dropouts or cumbersome to code. 2 in 1 Nano receiver unifies the keyboard and mouse connections into one USB port, plug and play quickly. SPECIAL DESIGN FOR WINDOWS. 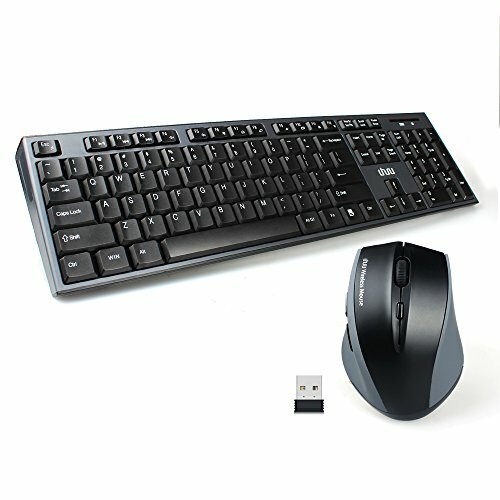 Wireless mouse and keyboard perfect compatible with Windows 10 / 8 / 7 / Vista / XP. Support PC, Notebook, Laptop, Smart TV, Surface Pro, no extra software or set up needed. 13 hotkeys instantly access to your movie, music, Internet, E-mail, volume, play/pause and more. COMFORTABLE AND SENSITIVE TOUCH. The full size keyboard with butterfly structure keys for smooth typing that's easy on your fingers and no input errors. Foldable stands provide a comfortable angle for you. Wireless optical mouse with ergonomic design and frosted on both sides suit your hand better. MULTI-LEVEL POWER-SAVING MODE. Automatically energy-saving and sleep with 8 minutes no-operation, click any key to wake-up in several seconds. Keyboard and mouse combo include the batteries, no need extra buying. Please noted pull off the small sticker in the battery compartment before use. EXCELLENT QUALITY THROUGH DAMAGE TEST. Compact size and seal structure makes it waterproof and dustproof. Durable keys withstand up to 10 million keystrokes. Undamaged after several times of 1kg pull apart test and 76cm drop test. WHAT YOU GET: one wireless mouse keyboard combo, one Nano-receiver, one AAA battery, one AA battery, welcome guide, 12 months for free replacement and friendly customer service.